Universe in a Box is an educational kit designed by the Universe Awareness project to assist educators in bringing astronomy and space sciences to 4–10 year old children. The toolkit was developed in response to a demand for practical, interactive and fun resources for bringing astronomy into the classroom. It provides teachers and educators with over 40 practical activities, as well as the materials and models required to do them. Universe in a Box comes with five modules: Our Fascinating Moon, The Earth — Our Home Planet, The Sun — Our Home Star, Our Solar System, and The World of Constellations. The comprehensive activity book includes all necessary background information, “how-to” steps, guidance on further experimentation and craft templates for use in the classroom. All the materials and models required to do the activities are provided in the toolkit, with the exception of commonly available materials such as clay, scissors or colour pencils. The educational goals of Universe in a Box are: to provide primary school teachers with a didactic tool that provides subjects, learning objectives and materials appropriate for the curriculum; to encourage enquiry-based learning among children, involving observing, discussing, drawing conclusions and presenting; to link astronomical topics with other subjects such as mathematics, art, and philosophy to present a more holistic view of our universe; and to make children aware that we are all inhabitants of a small fragile planet, encouraging a desire to protect the environment and respect other cultures. 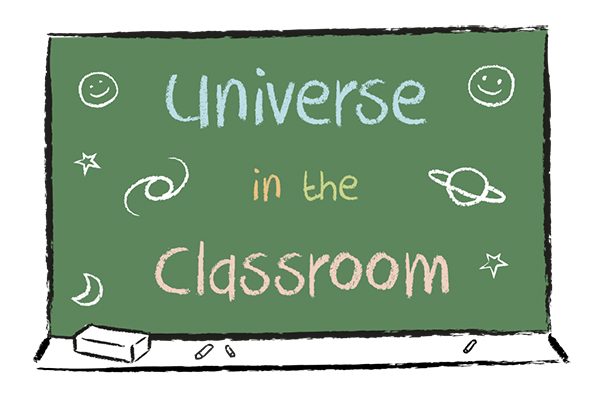 Universe in a Box has been developed, evaluated and refined as part of a Master’s degree from the University of Leiden and is currently being used by hundreds of educators in 15 countries.